I’m sure as a fellow business owner you know what I’m talking about when I say it feels like there’s a pressure about what we ‘should’ be doing to get clients in our business. It seems like everyone out there has the latest and greatest marketing strategy which you must do in order to get clients. But I have good news! A lot of these things we’re hearing are just lies and I will tell you honestly that I know you can run a fully booked studio without listening to the noise. So let’s first go through what everyone says you ‘should’ be doing in order to get clients as a web designer, and then what the facts really are. Create a podcast and guest post and be on Insta and FB, and Pinterest, and start a YouTube channel and master in-person relationships building and, and, and, and, AND! You get the point. It’s exhausting just reading it. In the beginning, I also felt the need to do all the marketing and implement every strategy in the client-winning book and I hated it! There were a select few marketing strategies I actually enjoyed - this blog being one of them, but everything else felt forced and try-hard. I would procrastinate on the marketing tasks I really didn’t like all the time - laundry?! Perfect! Vacuuming - ohhh yes please! Tidying up my desk - you betcha! Not to mention, I felt like I was making progress at molasses speed and that was really discouraging. It was only when I focused on doing ONE marketing strategy damn well that I felt I was making progress and started getting clients. So I hope this comes as good news to you, you absolutely do not need to be everywhere and do every strategy in the book when it comes to marketing - you just need to do one thing consistently and well and you’ll find success too. This is rather comical coming from me . . . on my blog, but it’s true and I want you to know it. You do NOT need to blog to get clients. (I’m sure a few of you over there are wiping your brows in relief, haha). Don’t get me wrong, blogging is hellah-effective and has built my business but that absolutely does not mean that it’s the only way. If you don’t enjoy blogging, it’ll be hard to stay consistent and produce good content. Blogging is just one potential marketing strategy and while it works (and is therefore why you keep hearing you ‘need’ to be doing it), it’s not the only way to get clients. If you want to blog - go crazy (and stay consistent.) If blogging doesn’t feel good to you or like too much of a commitment, feel free to just skip it and focus on implementing a strategy you actually enjoy. Let me explain low quality source quickly, I mean places like Fiverr, Upwork, Etsy and Craigslist. These places all have plenty of clients looking for what you offer, butttt I would argue sometimes it’s not worth doing work on these platforms. Why? Clients you find on places like Fiverr are looking for something quick & cheap and scope creep tends to be a real issue with bargain-hunter clients. Clients from these places don’t tend to value your professional advice and time. And let’s be real, you’re not going to get paid your worth with clients from these places. I know because I’ve seen it, if you work on these platforms long-term, it’s likely you’ll end up resenting your difficult clients, and hating what you do. I don’t think it’s worth taking on clients from these low quality sources if it means you’ll be overworked, underpaid and end up quitting because you are frustrated with your job. 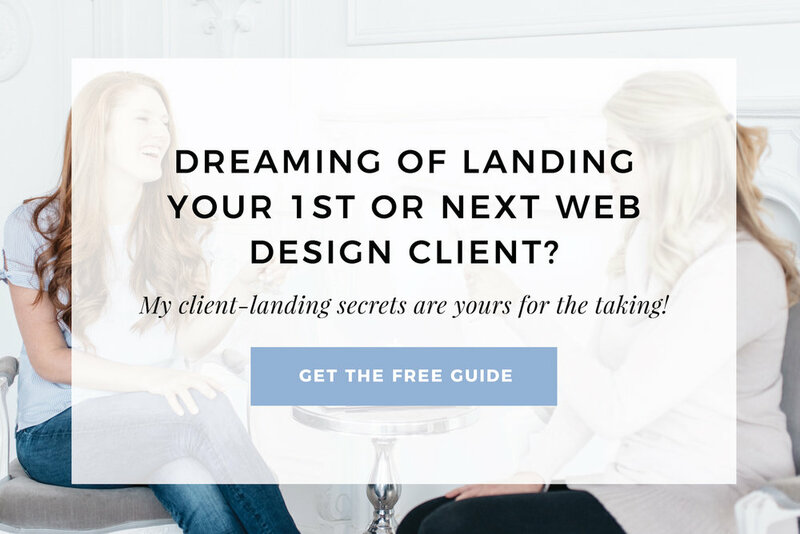 Sometimes, it’s best to pass on the crazies and focus on landing clients via strategies sources that get you the type of work and pay you really want. So . . . how exactly do you get clients? The ones you love? And how do you get a steady stream of them banging down your door trying to work with you? Inside my course Square Secrets Business both myself and some of the biggest and most successful web designers out there are spilling on the beans on exactly how it’s done! I’ve brought in the big names to teach the client-winning module and I just know that that module alone is going to seriously turn around a whole lot of web design businesses!